Established in 1973, Yih Feng Industrial Co., Ltd. is an ISO 9001:2008- and ISO/TS 16949: 2009-certified company specializing in aluminum-alloy forging, die-casting, and CNC machining. We’ve steadily invested in technique and equipment upgrading, using the most advanced software as Master/CAM 3D and top-end equipment as CNC machining centers, enabling us to become an internationally reputed specialist in designing and making high-precision parts, and a major supplier to many international vehicle makers. In conjunction with increasing investments, we’ve been broadening product line to include auto, motorcycle and bicycle parts, 3C parts, sporting-goods parts, among others. Continued business development has turned us into an international supplier with three factories in Taiwan (forging, die-casting, and assembly), employing about 300 workers and generating annual revenue of about US$30 million. 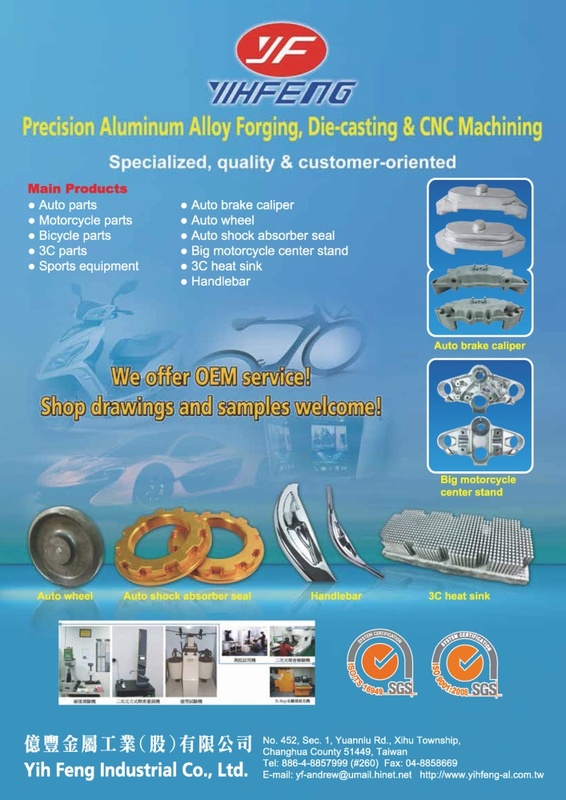 We are a strong OEM/ODM, providing rapid product design and development, volume production, and precision processing, backed by in-house tooling development ability, and top-end equipment. Targeting both local and overseas markets, we export mainly to Europe, while also aggressively developing markets globally. High quality and reasonable prices have enabled us to gain stringent certification by many international vehicle makers, such as Harley Davidson of the U.S. and Yamaha of Japan.